Diagnosis of ITP is carried out by mainly exclusion of thrombocytopenia caused by other etiology and therapeutic responses. Since thrombocytopenia may be associated with a variety of clinical conditions, careful exclusion is necessary. Blood smear examination is especially important to rule out pseudothrombocytopenia and some congenital thrombocytopenia. Bone marrow examination may not be essential to ITP diagnosis, but it should be performed in cases with abnormalities in CBC or blood smear other than thrombocytopenia, atypical clinical course, or refractory to standard treatments. 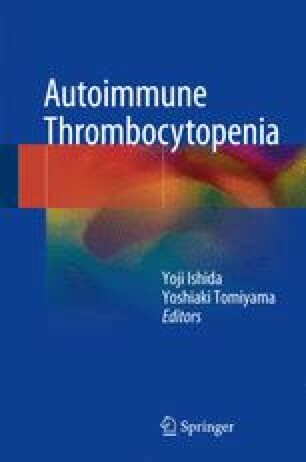 Assessment of reticulated platelets and plasma thrombopoietin concentration may be helpful to distinguish ITP from hypoplastic thrombocytopenia. This work was supported by Grant-in-Aid for Scientific Research from the Ministry of Education, Culture, Sports, Science and Technology and the Ministry of Health, Labour and Welfare in Japan.